The Abu Dhabi World Professional Jiu-Jitsu Championship 2019 is open entry to all fighters from all nationalities. The UAEJJF competition rules will be applied. A Technical Official from the UAEJJF will delegate responsibility to a suitable individual, who will be responsible for operating the category combining policy. Category combining may only be applied to categories where there are less than three entrants. If category combining cannot be achieved safely and according to the guidelines, then a pool of three elimination systems may be considered, or the best of three contests between the two players. When there is only one athlete on the bracket, points are not counted. For Abu Dhabi World Professional Jiu-Jitsu Championships 2019, the draw will take place two days before the fights begin. The draw will be carried out by computer with the use of the UAEJJF software using UAEJJF World Rank seeding. 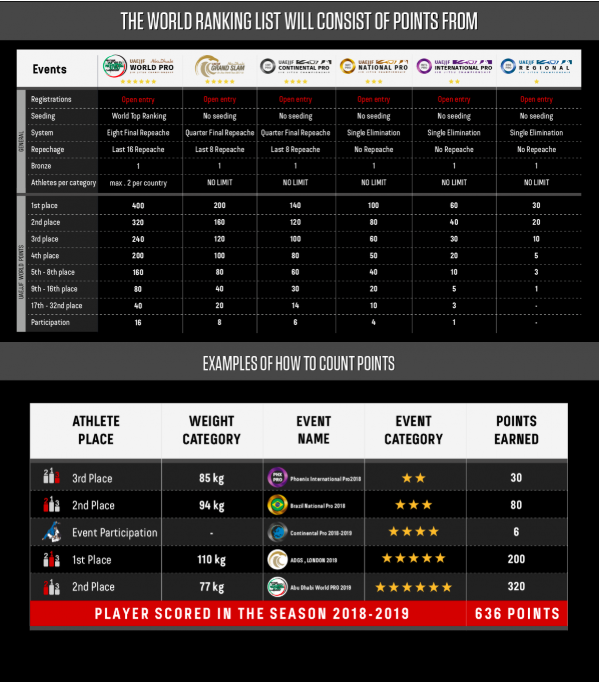 For the Abu Dhabi World Professional Jiu-Jitsu Championships 2019 the top athletes among the entered athletes in each weight category will be placed per their UAEJJF World Rank position. For the rest of the draw separation by nations will be respected. However, seeding position will take priority over separation by nation in categories where there are enough numbers to apply. With a limit number of fighters per country for each of the men’s and women’s competition, fighters from the same country will be placed on the same side of the brackets. 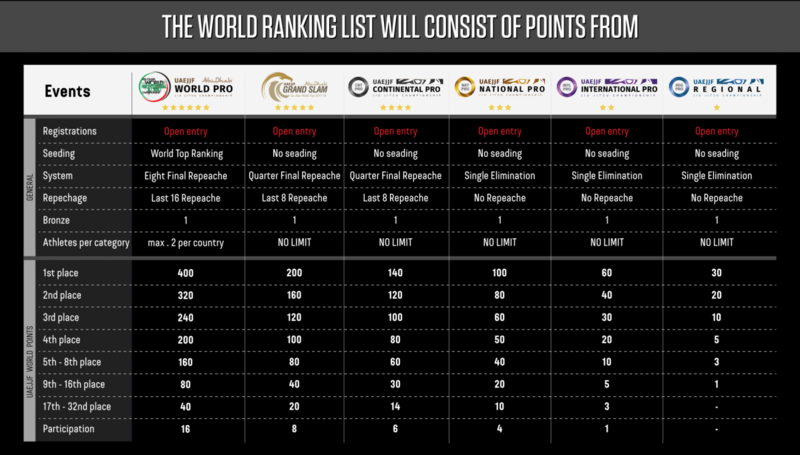 The UAEJJF will utilize the official UAEJJF World Ranking as a method of brackets seeding. All the fighters will be eligible for the Abu Dhabi World Professional Jiu-Jitsu Championship 2019, with a limit of 2 fighters from a given country to the eight or quarter or semi-finals (Adult & Master 1 - Brown and Black Belts divisions only). With a maximum of two eligible fighters (wild cards) from each country, applied for that countries does not already have two or more fighters among the top fighters ranked. For other belts only the countries seeding will be applied and no country limits for main brackets. If necessary, the UAEJJF Technical Director will agree to modify with technical commission approval. The top brown & black belt fighters (1st ranked) will be directly eligible based on the UAEJJF World Ranking. Only one top country fighter will be selected according the UAEJJF World Rank. *Priorities are given to the best ranked fighters to choose the division desired to register (weight category is not yet a determination). ** Fighters not ranked as a 1st at UAEJJF World Ranking in the respective division registered will be placed into the COUNTRY QUALIFIERS. The second additional fighter will be qualified through the COUNTRY QUALIFIERS (Applied for ADULT & MASTER 1 - BROWN & BLACK BELT DIVISIONS only). COUNTRY QUALIFIERS is a qualification method to select the 2nd fighter for the countries with over quota. COUNTRY QUALIFIERS will be defined one day before of the 2nd round on Thursday (eight or quarter finals or semi finals), check the schedule TAB for more details. The UAEJJF World Ranking is the mathematical method of ranking men and women on a calendar-year basis. 1. The UAEJJF World Ranking is the objective merit-based method used for determining qualification for entry and seeding in World Championships. 2. The UAEJJF World Ranking runs approximately 65 times per year (only GI championships). *NO GI championships will count points for NO GI Ranking. 3. Every fighter who has earned UAEJJF World Ranking points in an eligible UAEJJF championship during the entry ranking period is included in the UAEJJF World Ranking. 4. Fighters are not allowed to change their nationality or team academy during the season, due to the Country and Academy Ranking System. UAEJJF World Ranking period is from May 1st 2018 to April 30th 2019. The highest sum of the current points from all Grand Slams. The highest sum of the current points from all Continental Pro, followed by National Pro, International Pro, Regional Championships. The highest current points from one single event, then, if needed, the second highest, and so on. If the competitors are still equal the decision will be taken by the number of matches done by the fighter through the season, followed by the fastest submission(s) or who made more points during the matches in case of World Pro Qualification. Depending the Events, because the number of absenteeism/no showed up fighters. Brackets will be generated right after the Weigh IN. UAEJJF will decide in which event in order to accommodate all the fighters with one fight at least. If there's only one player, the division will be cancelled and they will be moved to the next divisions, 2 (two) is the minimum players for the division happen. Same case for Masters divisions. First Rule applied: Respect the age group. Divisions with 2 (two) players will run normally, Fighters won't be moved to next division. Fighters alone in a bracket will NOT have ranking points credited. Fighter will be moved for an upper divisions. Also in case where there is a non showed up or disqualification after the brackets are generated. The weigh-in will take place the day before the division starts or in the morning as indicated in the schedule. A maximum weight is applied according to the event divisions, a fighter should not exceed this weight on the weigh-in day (check divisions tab on this event). The Country Qualifier draw is a single elimination brackets that stops after a designated round. Fighters that have not been eliminated all advance to a specific spot in the main bracket where the champion is determined. Competitors who qualify advance into another double elimination brackets know as the main draw, but for World Pro other draw formats can also be used as the main draw, round robin tournament brackets will be used if the divisions has less than 6 fighters from different countries that meet the first rules, a maximum of 2 fighters per country in the main brackets.. In the Brown Belt and Black Belt divisions (Adult and Master 1), higher ranked fighter do not have to fight in the qualifier draw and have a seeded spot in the main bracket. The main draw that the qualifier draw feeds into has the top country seeded fighter that do not have to qualify matched-up against the lowest seeded qualifiers in early rounds. The qualifier draw would be used in a ABU DHABI WORLD PROFESSIONAL JIU-JITSU CHAMPIONSHIP only and will not be used in other event in the UAEJJF season. Grand Slams, National Pro, International Pro will have no limits per country and will run as single elimination brackets. Top fighters fights fewer matches. Top fights work hard to reach the points while other fighters has to qualify for their others spots. As the World Pro has 3 different days in length, having enough amount of rest time between the matches. After losing a match in the qualifier draw, a participant is out of the main brackets division.